The FII-BD9361 board covers all features and benefits of AD9361. The AD9361 is a high performance, highly integrated radio frequency (RF) Agile Transceiver™ designed for use in 3G and 4G base station applications. Its programmability and wideband capability make it ideal for a broad range of transceiver applications. Software tunable bandwidth: 200 kHz to 56 MHz. 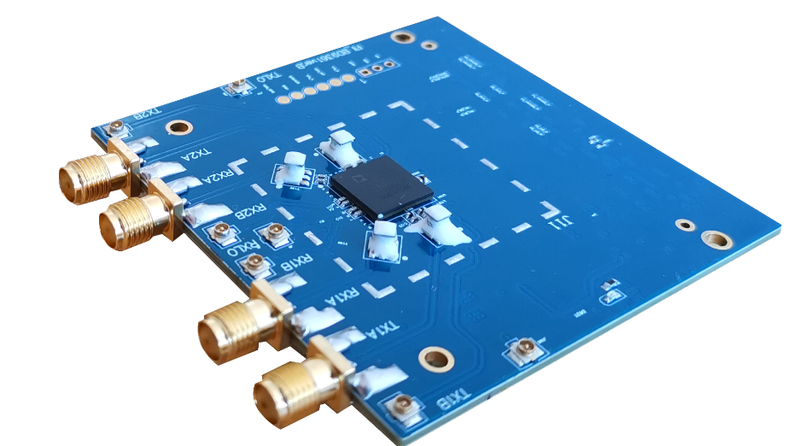 The FII-BD9361 is a high-speed analog module designed to showcase the AD9361, a high performance, highly integrated RF transceiver intended for use in RF applications, such as 3G and 4G base station and test equipment applications, and software defined radios. Its programmability and wideband capability make it ideal for a broad range of transceiver applications. 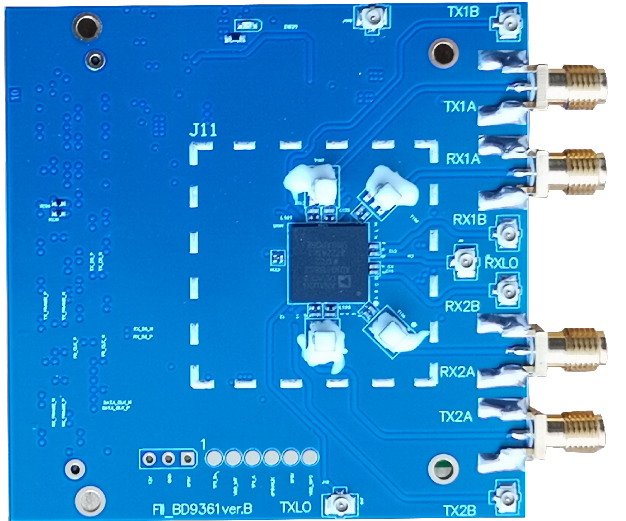 The device combines an RF front end with a flexible mixed-signal baseband section and integrated frequency synthesizers, simplifying design-in by providing a configurable digital interface to a processor or FPGA. The AD9361 chip operates in the 70 MHz to 6 GHz range, covering most licensed and unlicensed bands. The chip supports channel bandwidths from less than 200 kHz to 56 MHz by changing sample rate, digital filters, and decimation, which are all programmable. For more information, please check ad9361 introducation. Analog Devices AD9361 is a high performance, highly integrated RF Agile Transceiver™. AD9361's programmability and wideband capability make it ideal for a broad range of transceiver applications. The device combines an RF front end with a flexible mixed-signal baseband section and integrated frequency synthesizers, simplifying design-in by providing a configurable digital interface to a processor. The AD9361 operates in the 70MHz to 6.0GHz range, covering most licensed and unlicensed bands. Channel bandwidths from less than 200kHz to 56MHz are supported. The AD9361 is packaged in a 10mm × 10mm, 144-ball chip scale package ball grid array (CSP_BGA). Learn about the revolutionary AD9361 RF Agile Transceiver, a complete radio design for SDR applications. 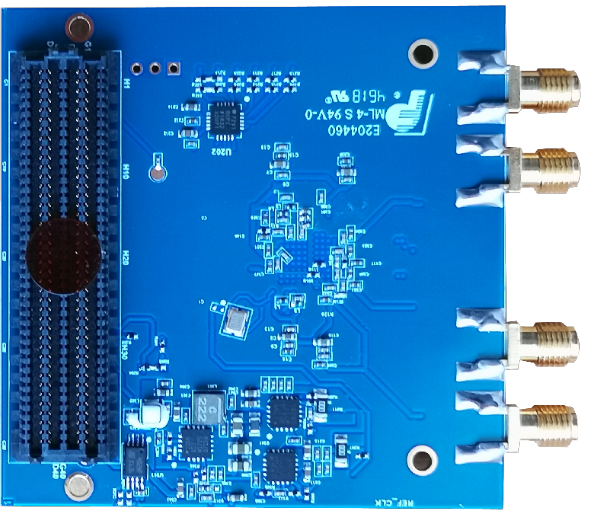 It achieves leading performance, high integration, wideband operation and utmost flexibility and is supported by the FII-BD9361 board. The AD9361 is a high performance, highly integrated radio frequency (RF) Agile Transceiver™ designed for use in 3G and 4G base station applications. Its programmability and wideband capability make it ideal for a broad range of transceiver applications. The device combines a RF front end with a flexible mixed-signal baseband section and integrated frequency synthesizers, simplifying design-in by providing a configurable digital interface to a processor. The AD9361 receiver LO operates from 70 MHz to 6.0 GHz and the transmitter LO operates from 47 MHz to 6.0 GHz range, covering most licensed and unlicensed bands. Channel bandwidths from less than 200 kHz to 56 MHz are supported. The two independent direct conversion receivers have state-of-the-art noise figure and linearity. Each receive (RX) subsystem includes independent automatic gain control (AGC), dc offset correction, quadrature correction, and digital filtering, thereby eliminating the need for these functions in the digital baseband. The AD9361 also has flexible manual gain modes that can be externally controlled. Two high dynamic range analog-to-digital converters (ADCs) per channel digitize the received I and Q signals and pass them through configurable decimation filters and 128-tap finite impulse response (FIR) filters to produce a 12-bit output signal at the appropriate sample rate. The transmitters use a direct conversion architecture that achieves high modulation accuracy with ultralow noise. This transmitter design produces a best in class TX error vector magnitude (EVM) of <−40 dB, allowing significant system margin for the external power amplifier (PA) selection. The on-board transmit (TX) power monitor can be used as a power detector, enabling highly accurate TX power measurements. The fully integrated phase-locked loops (PLLs) provide low power fractional-N frequency synthesis for all receive and transmit channels. Channel isolation, demanded by frequency division duplex (FDD) systems, is integrated into the design. All VCO and loop filter components are integrated. The core of the AD9361 can be powered directly from a 1.3 V regulator. The IC is controlled via a standard 4-wire serial port and four real-time input/output control pins. Comprehensive power-down modes are included to minimize power consumption during normal use. The AD9361 is packaged in a 10 mm × 10 mm, 144-ball chip scale package ball grid array (CSP_BGA). The AD9361 is a highly integrated radio frequency (RF) transceiver capable of being configured for a wide range of applications. The device integrates all RF, mixed signal, and digital blocks necessary to provide all transceiver functions in a single device. Programmability allows this broadband transceiver to be adapted for use with multiple communication standards, including frequency division duplex (FDD) and time division duplex (TDD) systems. This programmability also allows the device to be interfaced to various baseband processors (BBPs) using a single 12-bit parallel data port, dual 12-bit parallel data ports, or a 12-bit low voltage differential signaling (LVDS) interface. The AD9361 also provides self-calibration and automatic gain control (AGC) systems to maintain a high performance level under varying temperatures and input signal conditions. In addition, the device includes several test modes that allow system designers to insert test tones and create internal loopback modes that can be used by designers to debug their designs during prototyping and optimize their radio configuration for a specific application. The receiver section contains all blocks necessary to receive RF signals and convert them to digital data that is usable by a BBP. There are two independently controlled channels that can receive signals from different sources, allowing the device to be used in multiple input, multiple output (MIMO) systems while sharing a common frequency synthesizer. Each channel has three inputs that can be multiplexed to the signal chain, making the AD9361 suitable for use in diversity systems with multiple antenna inputs. The receiver is a direct conversion system that contains a low noise amplifier (LNA), followed by matched in-phase (I) and quadrature (Q) amplifiers, mixers, and band shaping filters that down convert received signals to baseband for digitization. External LNAs can also be interfaced to the device, allowing designers the flexibility to customize the receiver front end for their specific application. Gain control is achieved by following a preprogrammed gain index map that distributes gain among the blocks for optimal performance at each level. This can be achieved by enabling the internal AGC in either fast or slow mode or by using manual gain control, allowing the BBP to make the gain adjustments as needed. Additionally, each channel contains independent RSSI measurement capability, dc offset tracking, and all circuitry necessary for self-calibration. The receivers include 12-bit, Σ-Δ ADCs and adjustable sample rates that produce data streams from the received signals. The digitized signals can be conditioned further by a series of decimation filters and a fully rogrammable 128-tap FIR filter with additional decimation settings. The sample rate of each digital filter block is adjustable by changing decimation factors to produce the desired output data rate. The transmitter section consists of two identical and independently controlled channels that provide all digital processing, mixed signal, and RF blocks necessary to implement a direct conversion system while sharing a common frequency synthesizer. The digital data received from the BBP passes through a fully programmable 128-tap FIR filter with interpolation options. The FIR output is sent to a series of interpolation filters that provide additional filtering and data rate interpolation prior to reaching the DAC. Each 12-bit DAC has an adjustable sampling rate. Both the I and Q channels are fed to the RF block for upconversion. When converted to baseband analog signals, the I and Q signals are filtered to remove sampling artifacts and fed to the upconversion mixers. At this point, the I and Q signals are recombined and modulated on the carrier frequency for transmission to the output stage. The combined signal also passes through analog filters that provide additional band shaping, and then the signal is transmitted to the output amplifier. Each transmit channel provides a wide attenuation adjustment range with fine granularity to help designers optimize signal-to-noise ratio (SNR). Self-calibration circuitry is built into each transmit channel to provide automatic real-time adjustment. The transmitter block also provides a TX monitor block for each channel. This block monitors the transmitter output and routes it back through an unused receiver channel to the BBP for signal monitoring. The TX monitor blocks are available only in TDD mode operation while the receiver is idle. can vary between 10 MHz and 80 MHz. This reference clock is used to supply the synthesizer blocks that generate all data clocks, sample clocks, and local oscillators inside the device. Errors in the crystal frequency can be removed by using the digitally programmable digitally controlled crystal oscillator (DCXO) function to adjust the on-chip variable capacitor. This capacitor can tune the crystal frequency variance out of the system, resulting in a more accurate reference clock from which all other frequency signals are generated. This function can also be used with on-chip temperature sensing to provide oscillator frequency temperature compensation during normal operation. can be activated simultaneously. These PLLs require no external components. 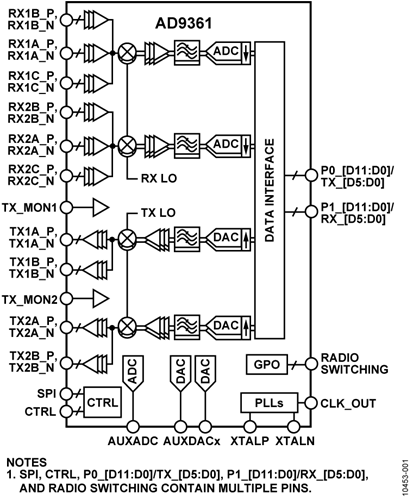 The AD9361 also contains a baseband PLL synthesizer that is used to generate all baseband related clock signals. These include the ADC and DAC sampling clocks, the DATA_CLK signal (see the Digital Data Interface section), and all data framing signals. This PLL is programmed from 700 MHz to 1400 MHz based on the data rate and sample rate requirements of the system. and various combinations of data ordering to transmit data from different channels across the bus at appropriate times. Bus transfers are controlled using simple hardware handshake signaling. The two ports can be operated in either bidirectional (TDD) mode or in full duplex (FDD) mode where half the bits are used for transmitting data and half are used for receiving data. The interface can also be configured to use only one of the data ports for applications that do not require high data rates and prefer to use fewer interface pins. RX data supplies the DATA_CLK signal that the BBP can use when receiving the data. The DATA_CLK can be set to a rate that provides single data rate (SDR) timing where data is sampled on each rising clock edge, or it can be set to provide double data rate (DDR) timing where data is captured on both rising and falling edges. This timing applies to operation using either a single port or both ports. For transmit data, the interface uses the FB_CLK signal as the timing reference. FB_CLK allows source synchronous timing with rising edge capture for burst control signals and either rising edge (SDR mode) or both edge capture (DDR mode) for transmit signal bursts. The FB_CLK signal must have the same frequency and duty cycle as DATA_CLK. throughout the burst or it can be pulsed with a 50% duty cycle. The AD9361 transceiver includes an enable state machine (ENSM) that allows real-time control over the current state of the device. The ENSM has two possible control methods: SPI control and pin control. In SPI control mode, the ENSM is controlled asynchronously by writing SPI registers to advance the current state to the next state. SPI control is considered asynchronous to the DATA_CLK because the SPI_CLK can be derived from a different clock reference and can still function properly. The SPI control ENSM method is recommended when real-time control of the synthesizers is not necessary. SPI control can be used for realtime control as long as the BBIC has the ability to perform timed SPI writes accurately. In pin control mode, the enable function of the ENABLE pin and the TXNRX pin allow real-time control of the current state. The ENSM allows TDD or FDD operation depending on the configuration of the corresponding SPI register. The ENABLE and TXNRX pin control method is recommended if the BBIC has extra control outputs that can be controlled in real time, allowing a simple 2-wire interface to control the state of the device. To advance the current state of the ENSM to the next state, the enable function of the ENABLE pin can be driven by either a pulse (edge detected internally) or a level. When a pulse is used, it must have a minimum pulse width of one FB_CLK cycle. In level mode, the ENABLE and TXNRX pins are also edge detected by the AD9361 and must meet the same minimum pulse width requirement of one FB_CLK cycle. In FDD mode, the ENABLE and TXNRX pins can be remapped to serve as real-time RX and TX data transfer control signals. In this mode, the ENABLE pin enables or disables the receive signal path, and the TXNRX pin enables or disables the transmit signal path. In this mode, the ENSM is removed from the system for control of all data flow by these pins. The AD9361 uses a serial peripheral interface (SPI) to communicate with the BBP. This interface can be configured as a 4-wire interface with dedicated receive and transmit ports, or it can be configured as a 3-wire interface with a bidirectional data communication port. This bus allows the BBP to set all device control parameters using a simple address data serial bus protocol. Read commands follow a similar format with the exception that the first 16 bits are transferred on the SPI_DI pin and the final eight bits are read from the AD9361, either on the SPI_DO pin in 4-wire mode or on the SPI_DI pin in 3-wire mode. The AD9361 provides eight simultaneous real-time output signals for use as interrupts to the BBP. These outputs can be configured to output a number of internal settings and measurements that the BBP can use when monitoring transceiver performance in different situations. The control output pointer register selects what information is output to these pins, and the control output enable register determines which signals are activated for monitoring by the BBP. Signals used for manual gain mode, calibration flags, state machine states, and the ADC output are among the outputs that can be monitored on these pins. The AD9361 provides four edge detected control input pins. In manual gain mode, the BBP can use these pins to change the gain table index in real time. In transmit mode, the BBP can use two of the pins to change the transmit gain in real time. The AD9361 provides four, 3.3 V capable general-purpose logic output pins: GPO_3, GPO_2, GPO_1, and GPO_0. These pins can be used to control other peripheral devices such as regulators and switches via the AD9361 SPI bus, or they can function as slaves for the internal AD9361 state machine. The AD9361 contains an auxiliary ADC that can be used to monitor system functions such as temperature or power output. The converter is 12 bits wide and has an input range of 0 V to 1.25 V. When enabled, the ADC is free running. 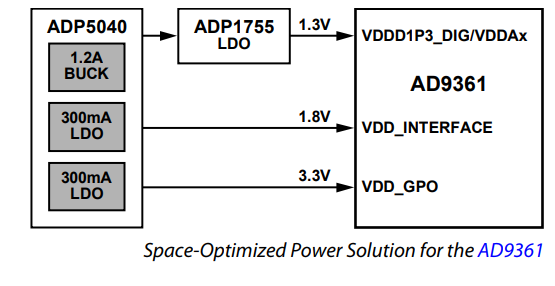 SPI reads provide the last value latched at the ADC output. A multiplexer in front of the ADC allows the user to select between the AUXADC input pin and a built-in temperature sensor. The AD9361 contains two identical auxiliary DACs that can provide power amplifier (PA) bias or other system functionality. The auxiliary DACs are 10 bits wide, have an output voltage range of 0.5 V to VDD_GPO − 0.3 V, a current drive of 10 mA, and can be directly controlled by the internal enable state machine. the analog supply (VDDD1P3_DIG/VDDAx = 1.3 V), the interface supply (VDD_INTERFACE = 1.8 V), and the GPO supply (VDD_GPO = 3.3 V). For applications requiring optimal noise performance, it is recommended that the 1.3 V analog supply be split and sourced from low noise, low dropout (LDO) regulators. Following figure shows the recommended method. For applications where board space is at a premium, and optimal noise performance is not an absolute requirement, the 1.3 V analog rail can be provided directly from a switcher, and a more integrated power management unit (PMU) approach can be adopted. Following figure shows this approach. Copyright © 2019 FPGA Board - Buy FPGA Board. All rights reserved.